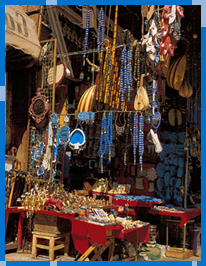 Cairo offers an incredible selection of shopping, leisure, culture and nightlife. Shopping ranges from the famous Khan el-Khalili souk, a bazaar largely unchanged since the 14th century, to modern air-conditioned centers displaying the latest fashions. All the bounty of the East is found here. Particular good buys are spices, perfumes, gold and silver, carpets, brass and copper ware, leather work, glass, ceramics and mashrabiya. Try some of the famous street markets, like Wekalet al-Balah, for fabrics, including Egyptian cotton, the Tent makers' Bazaar for applique-work, Mohammed Ali Street for musical instruments. Although you probably won't want to buy, the Camel Market also makes a fascinating trip.